A young onion farmer from India’s Vijayapura district has designed a shed that increases the shelf life of onions by at least two months. Rajkumar Aski, an onion farmer from Hachal village of Sindgi taluk, has designed a simple yet effective onion storage shed with the help of Social Media and Horticulture Department tips. Cultivating onion on his six acre land, Aski was always worried about his onions’ shelf life being less than two months. “To harvest onions, like other farmers, we would construct a traditional shed using tur hay, at a cost of ₹20,000-30,000 (€240-355). The disadvantage was that we had to build such a shed every year." While browsing social networking sites, he found a scientifically designed onion shed. Then, he decided to replicate it in his farm. He said that he made only minor changes in the traditional design to provide ample ventilation. 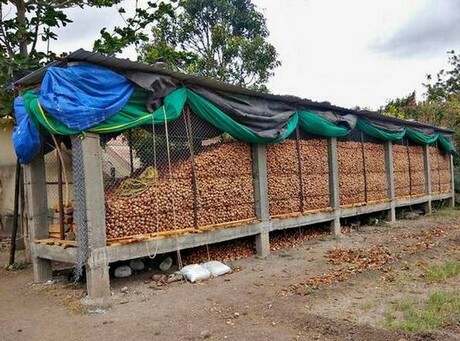 Aski spent around ₹1.4 lakh (€1650) on the shed that can store 900 bags of onions. The Horticulture Department later gave him a subsidy of ₹87,000 (€1030). He claims the new design extended the shelf life of onions by at least two months. “In the old shed, we saw wastage of nearly 40% as moisture caused onion rot. In the new shed, wastage has been reduced to 5%,” he said.